What is Known About the Indian Mounds? Today, there are six remaining Indian Mounds found on both sides of the current pavilion. At one time there were thirty nine, found in two separate areas along the bluff, but they were destroyed by early farming, houses and park development. These burial sites have been researched, photographed and written about extensively. However, there are still many unanswered questions about their origin and significance. There is an informational plaque behind the pavilion, but it is filled with questionable assumptions. The information contained here includes some confirmed facts as well as a few uncertain statements. One of the first questions to ask might be, "when were they built?" No one knows for sure. An educated guess would be that they were constructed-probably a few at a time-between 200 BCE and--400 AD. They are certainly the oldest remaining examples of human works in Saint Paul. Many scholars see them as part of what they call the Hopewell culture, a concept that includes the beliefs and practices of Native American peoples who built mounds in many area of the country. Another query: "who built them?" Again, there is uncertainty. The park plaque says that they were the handiwork of Hopewellian people who moved eastward into the area. However, there is no proof of this and it could be that the local residents were just influenced by the Hopewell practices. One source said that the mounds here are the sole archeological example of Hopewellian characteristics in Minnesota. The Dakota, who were here when European settlers arrived, made use of the mounds for some burials, but may not have been the original builders. 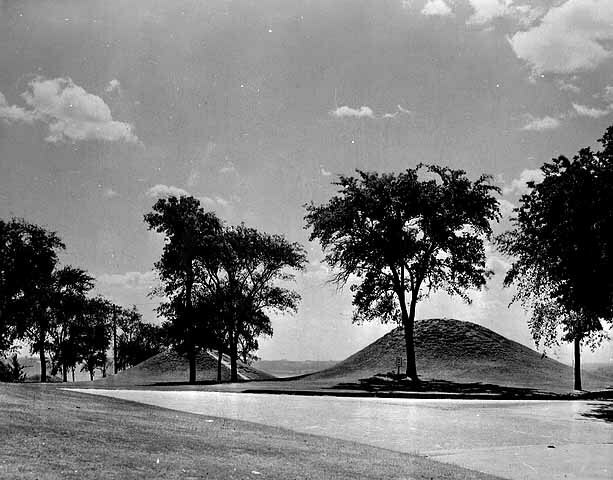 One of several sources on the matter include a note in an 1849 issue of the Pioneer Pres, which stated that “mounds… are a subject of wonder and admiration... their ancient and inscrutable origin, baffle even conjecture. The present race of Indians, know as little of them as ourselves.” The truth is, we may never know who the mound builders were. What do we know about the people or peoples who created the mounds? Once again, small bits of information allow a few speculations. Early excavations suggest the mound builders may have had a structured society with art that included figures with religious implications. The mounds that were examined contained carved animals on the utensils and pottery possibly used for feasts and rituals. Artifacts that were found included stone knives, copper axes, a variety of carved pipes, pottery vessels, and ornaments made of copper and shell. Some items were made of material not available locally. There was volcanic glass from Wyoming, copper from Lake Superior area, mica from the Appalachia and marine shell from saltwater oceans. This suggests the existence of an extensive trade network. We are also not sure who got buried there. Probably not everyone, or there would have been hundreds of mounds. Perhaps some leaders or prominent people. Several types of burials were discovered. Most were simple internments accompanied by mussel shells or projectile points. There were log tombs at the base of some mounds and two others contained seven inch high thin limestone slabs set upright. Human remains found there were accompanied by more elaborate grave offerings, including shells, perforated bear teeth and a hammered sheet of copper. Small bundle burials were found in the upper parts of several mounds and may have been placed there in more recent times. Only four complete skeletons have been found in Dayton’s Bluff. On September 20, 1895, city park workers, razing Mound number eight “to improve the view from the park road”, came upon what they called “a gruesome find” after several tons of earth had been removed. The sets of bones were in the center and on the bottom of the burial mound. While city residents were fascinated by the Indian Mounds, they were far from reverential in their actions. For years there were spiral paths cut into the burial sites so people could easily walk up to see the scenery. For many years there were poles for electric wires going through the area and even imbedded in the side of a mound until the utility company was forced by law to remove them. Attitudes were changing by the 1980’s and this made for changes in the area around the Indian Mounds. In 1981 the city removal of roads between the burial sites and the bluff were completed, improving the setting and relationship of landscape to the topography. Around the same time, the Dayton’s Bluff Community Council led a successful effort to place decorative fences that still remain around the mounds to protect them from thoughtless visitors. 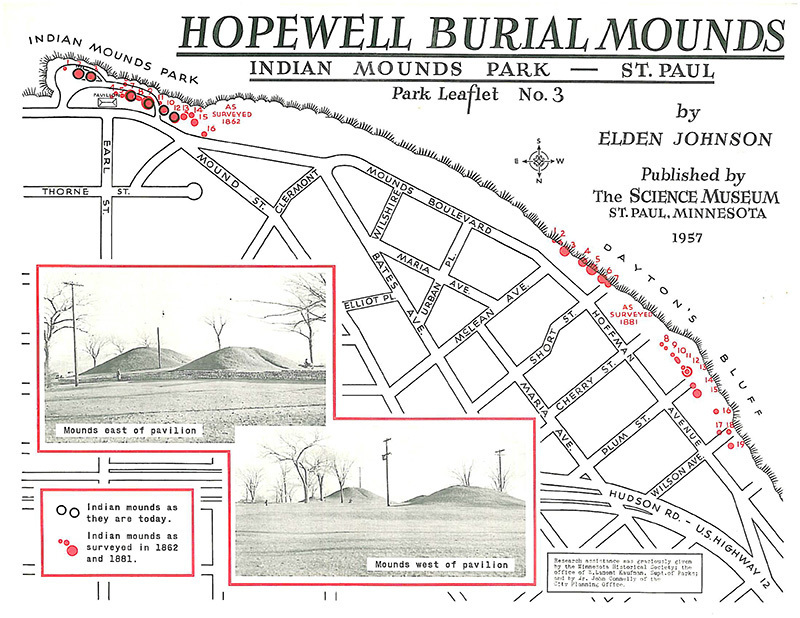 Steve Trimble, “What is Known About the Indian Mounds?,” Saint Paul Historical, accessed April 21, 2019, https://saintpaulhistorical.com/items/show/184. To learn more about the historic photographs displayed in this story, visit the Minnesota Historical Society’s Collections Online For more information on the Indian Mounds Park including historic and recent maps, plans, and archeological information, visit the City of Saint Paul Website.